In large crowds of people, it is very easy to lose track of those who we are with. Whether it be family friends, relatives, business associates, or any other groups of people, it can be difficult to keep track of where we are and where others are. This is especially true when it comes to sporting events. Baseball games, football games, NASCAR races, and other sporting events garner some of the largest crowds out of any other events throughout the year. Some stadiums have a capacity of over 50,000 people, and being one individual in this massive swarm of people can be quite overwhelming. Two way radios for sporting events can be the perfect solution to the problem, allowing us to communicate with our group regardless of our location or how big the crowds at the event may be. Most would think of using their cell phones to communicate with others at sporting events. However between the crowd noise, the PA system, and the overall volume of the event’s excitement, it can be difficult to hear someone on the other end of a cell phone. Additionally, the concentration of thousands of cell phones in one area can impact signal strength and prohibit us from being able to use cell phone. The use of two way radios suited for sporting events avoids both of these problems, as the volume and projection of sound from two way radios is much stronger than a cell phone and the line of communication is not impacted by the presence of other cell phones in the area. As long as the two way radios are on the same channel, you are able to instantly communicate with others instantly and efficiently. Whether it be your friend all the way in the parking lot who is arriving at the stadium late, your co-worker who wants to confirm your food order at the concession stand, or any other scenario, two way radios for sporting events will give you peace of mind knowing that your group is at arms’ length. 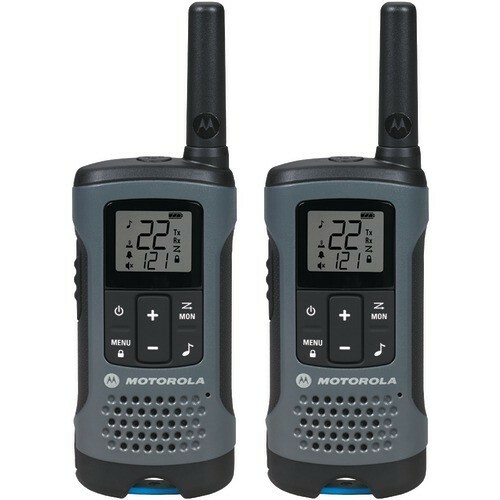 The Motorola Talkabout T200 is one of the more basic models of two way radios for sporting events on the market. With a weight of 0.4lbs including the attached battery pack, you will barely feel the radio when in your pocket or attached to your person via belt clip. This model has a communication range of 20 miles, which gives you the ability to communicate with others before you have even arrived at the sporting event. With an included NiMH battery pack, the radio has a battery life of 12 hours, allowing you to use it the entire day. From arrival, throughout the tailgate, and even throughout the event itself, the Talkabout 200 will be there when you need it. Users can also use three AA batteries, giving the radio a battery life of 29 hours. This is quite extensive for such a compact model and can be great for sporting events that occur over long periods of time, such as a doubleheader baseball game. The Motorola Talkabout T400 22 different channels, 121 privacy codes, 2 mile neighborhood communication range; what’s not to love? Seven out of the eleven weather channels are National oceanic and Atmospheric Association (NOAA) affiliated and the radio locks into your local channel for the most accurate report, so you know whether or not the elements could potentially impact your sporting event. There are three different ways to power up your radio, but the NiMH 8.5 hour battery is the most effective. If you are using the radio in your vehicle on the way to the stadium or ballpark, you can use a micro-USB cable to connect it to a constant power source. It also connects to a computer. With just three AA alkaline batteries, the Talkabout T400 can last up to 21 hours if you do not have access to a consistent power source. Come playoff time when the crowd is extra amped and the noise it at its highest, the Talkabout T400 has iVOX/VOX technology, which acts like a speakerphone. This gives you the ability to hear your friends and family all over the sporting event, whether you are in the front row or in the nosebleeds. This is one of the more heavy-duty models of two way radios for sporting events. The Motorola MS355R has a waterproof protection level of IP67, meaning that it can withstand even the most treacherous thunderstorms. Motorola prides itself on its ergonomic design incorporated into the MS355R. The radio fits perfectly into the palm of your hand, reducing the impact that it may have on the muscles in your hand and eliminating any sort of fatigue from the equation. This model’s also has a repeater function, meaning that your signal is projected further and stronger through connection to local repeater channels. If your sporting event is extremely loud, the MS355R has a vibrate function that alerts you when a signal is coming in, so you do not have to hold the radio to your ear waiting to hear the alert tone. This allows you to enjoy the game and be able to communicate with others around the stadium seamlessly. One of the more attractive characteristics of this two way radio for sporting events is its cost-effectiveness. With an average price of just over $40, it is one of the lowest cost, high performance two way radios for sporting events on the market. If the price does not entice you, maybe the more technical specifications will. 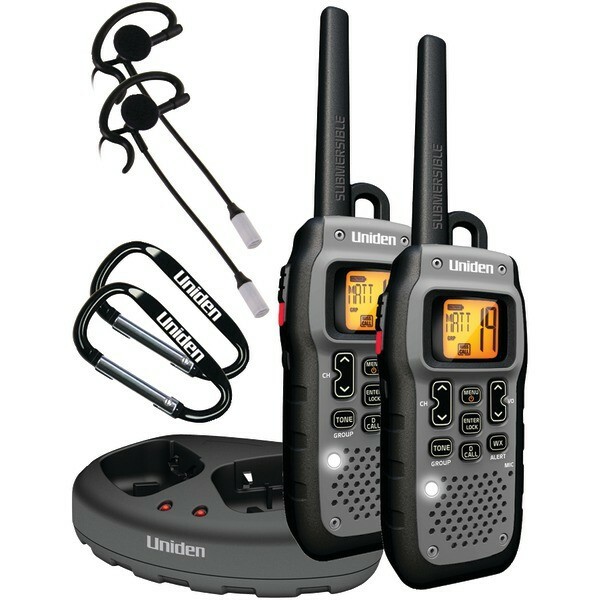 The Uniden GMR2638 is capable of fitting a VOX or PTT headset, which gives you the ability to get a clearer understanding of the communicated message without having to fight the crowd noise to hear it. It also has a lightweight NiMH rechargeable battery pack for both radios, so when you have exhausted the nine hours of battery life, charging is simple and effective. 121 privacy codes eliminate the potential for other signals to interfere with yours, so even if there are other users of the same model on the same channel in the ballpark, using a unique privacy code will secure your conversation. This model is the more high performance cousin of the Uniden GMR2638. Compared to the GMR2638’s 35-mile communication range, the GMR5089 has a whopping 50-mile communication range. This gives you an idea of the signal strength that this model can achieve in closer quarters, like end zone to end zone at a football stadium, for example. 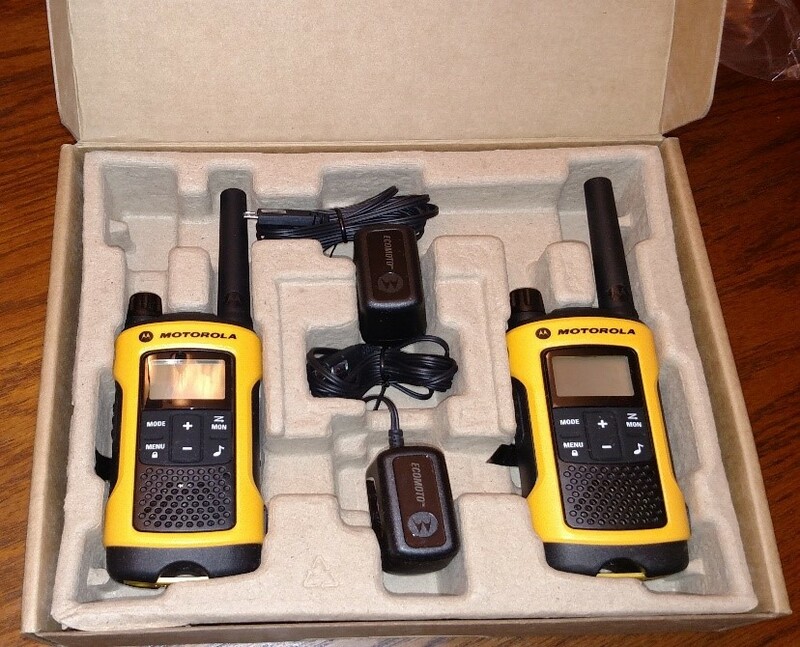 This two way radio can be submerged in water for up to 30 minutes, so a thunderstorm during your sporting event is no match for the device and you do not have to worry about any sort of damage when the elements ruin the party. If you want to predict any sort of weather that could impact your sporting event, the GMR5089 has multiple different weather channels of the NOAA, telling you what to expect in your area. An interesting feature of the Uniden GMR5089 is the direct call feature. 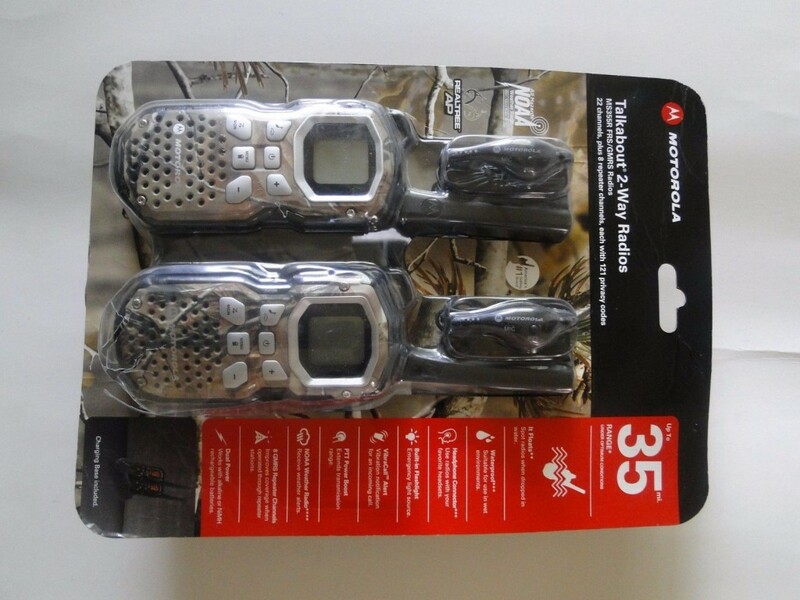 This allows you to use the two way radio as a cell phone, putting in a direct call to another user by using a specifically assigned pin code. The radio even has a ring tone as a cell phone would. The direct call feature is perfect in emergency situations or if you quickly need to determine the location of other group members. Of all of the two way radios for sporting events out there, these models find themselves a cut above the rest. Some are more high performance and can even be used in outdoor settings along with sporting events. Others are more basic models and are best served to stay specifically at the stadium or ballpark. Regardless of what sporting event you attend and the size of your group, two way radios for sporting events have something for everyone.